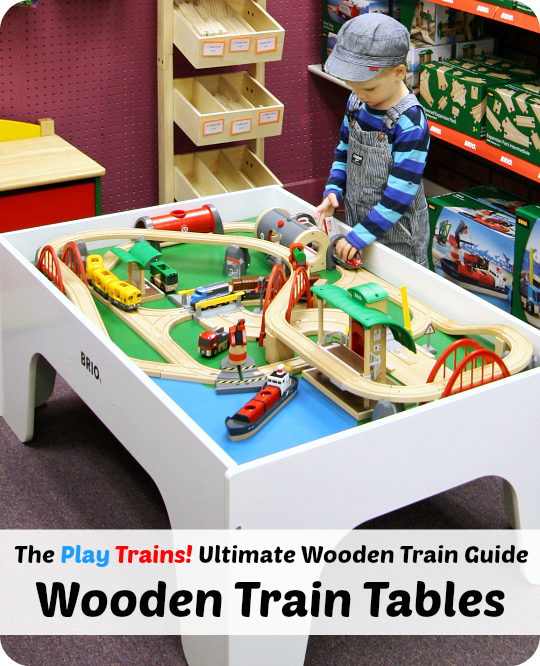 Along with wooden train sets, wooden train tables are a classic feature in the children’s playroom at home and the preschool classroom. It can be hard, however, to get an idea of all the options that are out there — after all, I consider myself a pretty expert train stuff finder at this point, and it took me several different search tactics to discover all the train tables here on this list! And so I hope this list of the best train tables for toddlers and preschoolers will be helpful in your search. This guide was last updated on September 10th, 2018. This post contains affiliate links to websites that sell these products. If you click on one, we may receive a small commission — at no additional cost to you — on anything you buy for a certain length of time afterwards. Read our disclosure policy for more details. It’s taken me a long time to figure out how to write this post. While I have a great deal of first-hand knowledge regarding the different brands of train sets, there are only so many train tables that one family can own (in our case, one at home and one at my mom’s house). However, as I got into the research for this, I realized that we’ve played on many different train tables in bookstores and toy stores, and from carefully reading as many reviews as I could, I think I was able to tell which train tables were a good bet. I’ve listed as many train table options as I could here, but as you’ll read, some of my recommendations for the tables on the list are much more enthusiastic than others. But, before you read this list, there’s a question you should ask: do you really need a train table? If you’re unsure whether or not you should buy a train table, you should read my honest rundown of the pros and cons of train tables, based on my own experience and on conversations with other train parents. I’ve changed people’s minds in both directions! If you already have a complete wooden train set, or plan on purchasing one separately, buying a train table that doesn’t come with a train set makes a lot of sense. Also, most of the higher-quality tables I found do not come with train sets included, so if you can afford to buy them separately, I recommend starting here. If you buy a train table and need a set to go with it, you can find lots of great options in our Guide to the Best Wooden Train Sets (which now appears in both a US edition and a UK edition). These are likely the sturdiest, safest way to go when buying a train table. Some of them are also a very, very good deal in comparison to some of the name brand train tables I’ll list below, considering they’re much better made with better materials. If you can get one of these, it’s probably your best bet. Especially if your little one is likely to try to climb on top of the table like mine did! Made in the USA from all birch wood and finished with an industrial-grade, low-VOC, non-toxic finish. 3/4″ hardwood legs and solid construction make this a sturdy table that seems like it will hold up to a lot of play. You can fit two Sodura Birch Train Table Trundle Drawers underneath for storage. Judging from the Amazon reviews, this table would be an excellent choice. At 19 inches tall, these tables are almost as high as the Beka table below, which is great as preschoolers get taller. Also available: Storage Drawer Set Finish: Sanded/Unfinished and Storage Drawer Set Finish: Natural Lacquer. This train table is made in the USA out of unfinished solid maple with a Baltic birch two-piece top. You can also purchase Beka train trundle drawers separately (two will fit under the table) or buy the table together with two drawers for pretty much the same price as buying them separately. Their website states that half the table is made in the USA, with a sturdy hardwood frame and melamine top. This seems to be a very innovative table, coming in two different sizes and the option of having holes around the outside that allow you to attach accessories to connect to many different kinds of toys. They also sell LEGO/DUPLO-compatible base plates that fit their tables. The company has obviously put a great deal of thought into making the table as functional as possible. The tables are 19″ high, but you can also purchase 24″ legs to allow the table to grow with your child. Train Tables Online is another source for hardwood, Made-in-USA wooden train tables. Their train tables come in cherry, red oak, poplar, and maple. You can choose different play boards for the top, from Thomas-brand ones to solid wood boards that match the table. Trundle drawers for storage are also available. They also offer custom finishing services. These are somewhat more expensive than the Beka and Little Colorado tables, but they do look quite lovely. International shipping may be available; the website says to contact for shipping quotes to locations outside of the 48 contiguous states. Choo Choo Track & Toy Co. also has a Made in the USA wooden train table. It’s more expensive than the others on this list, but once again, it looks like a very nice option. Shipping is only available within the 48 contiguous states. A made-in-the-USA activity table with interesting shelves beneath the table top. We had a TAG toddler table and chair for our son when he was littler, and we loved it. The chair also was a nice size to pull up beside his train table. These sturdy plastic activity tables are easy to put together — once you have the hang of it, it only takes a few minutes! — and you can rearrange them in different configurations. The pieces fit back into their original box, making the tables ideal for grandparents or families living in small spaces because the table can be packed away in a closet or attic when not in use. This is also a great table to use at events outside of the home, or at children’s museums, train museums, or in preschool classrooms. I own four of the 2 section packs, and I take them with me to train shows when I’m promoting my wooden train book with the custom train set I made to go with it. I really enjoy using these tables, and I wish I’d known about them when the Little Engineer was younger! While they may not be made from wood, there are lots of practical reasons that make them a very useful option. I like the simple scenery painted on this table — solid green for grass, with blue in one corner for water. We’ve played on this table at toy stores, and it’s a nice one. This play table is designed to work with the Brio Deluxe Railway Set, which has been a very popular set with our readers after we recommended it highly on our list of the Best Wooden Train Sets. This is a taller train table — 18.5 inches in comparison to 16 inches on a KidKraft table I checked — which makes it a better height for preschoolers as well as toddlers. This table features a storage area beneath the three-piece play top. The product photo demonstrates leaving one piece of the play top in place to create a multi-level train layout, which looks like fun. The play top is reversible, with a jungle (or countryside) theme on one side and a city theme on the other. This table includes a double-sided table top with a landscape design on one side and plain green paint on the other. 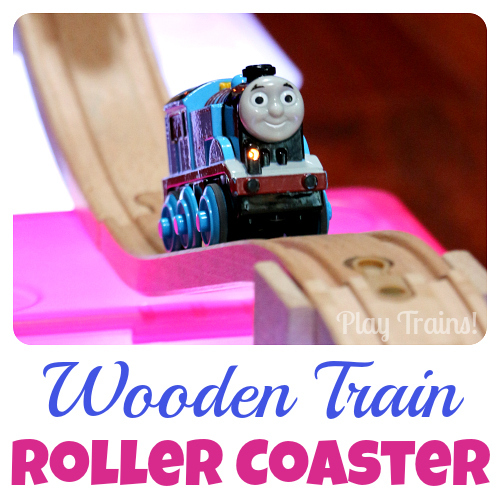 While we don’t have any experience with Bigjigs train tables, we do have a number of their wooden trains, and I consider it a good brand to go with. This train table was available in the US on Amazon when I started this list, but now seems to be sold out. I’ll add the US link back in if that changes. Plan Toys is one of the most eco-friendly toy companies making wooden train products that are widely available. This train table is made from unfinished rubberwood. However, it doesn’t seem to be solid rubberwood…most of the reviews I read described it as particle board. You can also purchase matching toy drawers (two will fit under the table). If your child loves Chuggington, this may be exactly what you’re looking for. It’s designed to go with the All Around Chuggington Set. I’m hesitant to recommend KidKraft train tables due to the mixed reviews, but many people like their KidKraft tables. This is an interesting, attractive, modern play table. The two-piece top is reversible, with a plain wood side and a chalkboard side, and beneath is a storage space that is painted with train set scenery, so a small train set could be concealed beneath the top during other activities or when the table not in use. This is a fairly small train table, nice for a small space. This is a standard-size white train table with a two-piece green play board top. The reviews on this one are pretty mixed. It also includes a “jumbo” drawer in the side…which I would just call a “drawer”, because it looks like it would waste space that could be used to slide a larger storage tub underneath the table. A all-in-one train table and train set package can be an exciting gift, and has the benefit of coming with everything you need to play included. This can save you a lot of money, but sometimes you get what you pay for (the only brands from my Best Wooden Train Sets list that make train tables with sets included are Bigjigs and Imaginarium.) Often the play board top for the table is painted or printed with a design that coordinates with the train set, which can look nice, but can also be limiting once your child is ready to build their own train layouts. 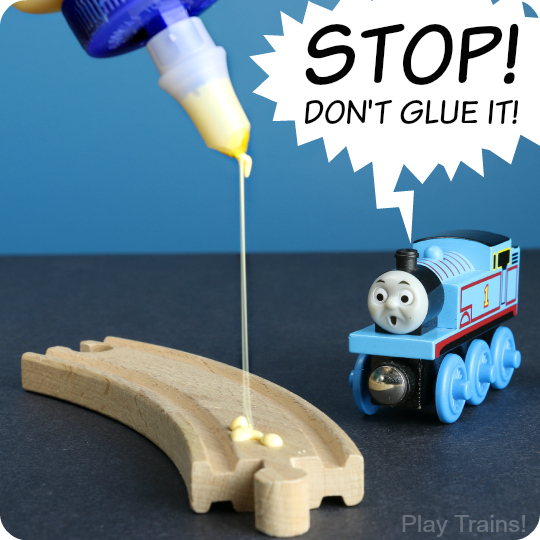 Also, the temptation to glue these train sets to their matching train tables is strong, so do yourself and your child a favor and read our list of Alternatives to Gluing Train Tracks to Train Tables to find out why and how to avoid this. 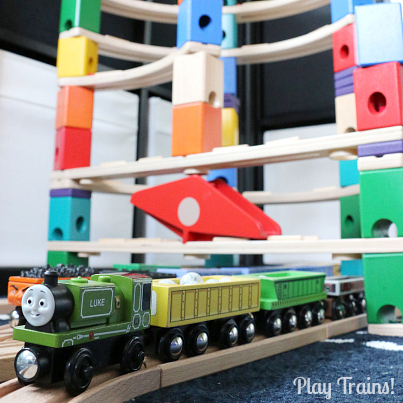 Bigjigs is one of the brands we recommend on the Best Wooden Train Sets list. The quality is decent, and I appreciate their innovative and unique designs. This is a great set for learning about community helpers. Another Bigjigs train table and set, this time with a city theme. If you have a Dinosaur Train fan, this might be the perfect train table for you! This is very small for a rectangular train table. I wouldn’t expect great quality and the layout is pretty simple, but the bright and colorful images all over the table would be appealing to some children. KidKraft Train Tables: I’m including these on the list, even though I’m still hesitant to recommend them. Some people — including a blogger friend I trust — love their KidKraft train tables. In real life, I’ve heard frustration with them. And online, the reviews are extremely mixed — some people are really happy them, some people feel that the tables aren’t sturdy and the tracks are splintery and not high quality, among other complaints. I have two theories: there could be a wide variation in the quality of different products, and between production runs of the same product, or this could just be a brand that rides a quality line, and you get a lot for what you pay, but it may or may not last as long as you like it to. If you’re looking at a KidKraft table, you should compare it to the Imaginarium train tables sold at Toys’R’Us, which I do recommend. KidKraft also makes a matching Train Table Trundle Drawer – Natural ( US / CA ). Check the dimensions to make sure the drawer or drawers you order will fit beneath your table, because the dimensions of the KidKraft tables vary. This is a budget train table that gets surprisingly good reviews. I have no idea how it stacks up in terms of quality with, say, KidKraft and Imaginarium, but people seem happy with it. At this price, it’s worth a look. Imaginarium train tables: Note: sadly, Toys’R’Us has closed all of their stores, except for the ones in Canada, which are still open and still selling Imaginarium train sets and tables. Toys’R’Us generally has at least one Imaginarium train table available. I feel they’re a good value for the low price, especially if you get one — as my mom did — when it’s on sale. While our table has gone onto another home (it was still in good condition at the time), we still use a lot of the pieces from the train set that came with it. Bigjigs is a brand we recommend: the quality is decent, and the design of the toys is inventive and interesting. This train table has an interesting shape and a drawer. This table is very similar to the table we own, although ours is white with a blue two-piece top, and this has a natural look with a one-piece green top. (We really like our table!) The product description says it’s made from 100% hardwoods (at least, it does when you scroll down to see the version without the “1%” typo), although I can’t find any confirmation of that in the reviews. It also includes a small fabric storage bin. This is a very small (23″ x 23″) play table, suitable for toddlers or very tight spaces. The play board is reversible, with scenery for a train set on one side and a LEGO-compatible surface on the other side. When you lift up the board, there is storage underneath. This is an interesting twist on the idea of a train table: a three level tower. It takes up much less space than a regular table, and it may be a good choice for toddlers because there are tracks built into the two upper layers. There’s also a crane to lift supplies from the second level to the third and back again, and the bottom level is meant to be built into a wooden train layout on the floor. This was a fun and easy project! See how I made an outdoor train “table” / garden for my son last summer with no tools required. He thought it was so cool! What I thought was especially cool about this idea is that it’s a temporary transition. Your child’s toddler bed can go back to being a place to sleep in time for bedtime! I hope to eventually do a full post on DIY train tables, but for now I have a Pinterest board filled up with all the best ideas I could find. We do have a few posts here on Play Trains! featuring the beautiful wTrak DIY modular wooden train tables that you should take a look at if you’re interested in making your own, especially for younger children or a public space. Follow Jessica | Play Trains! | Epic Fun for Kids’s board DIY Train Tables on Pinterest. Once you have your train table picked out, you’ll want to browse our Train Play archives for lots of ideas of what to do with them! You may want to read our Guide to Wooden Train Tracks for advice on expanding upon a basic train set as well. I also recommend signing up for our email newsletter to keep up with our new train ideas and activities as we post them. Need a train set to go with your new train table? I second Nilo! We did a lot of hunting around before choosing it. Its solid wood and extremely sturdy, which was a must for us after seeing our friend’s son climb up on theirs! It also looks more like furniture than a toy, with a beautiful stained finish. This was big for my husband since its currently in the middle of our family room. It also allows you to purchase taller legs as your child grows, bins for underneath, stools, and even Lego mats that fit for later when they moved on from the train stage. I recently bought a used Maxim Enterprise Inc Train Table (without the train set/tracks). I’m wondering if you have a link or guide on how to fit track layouts into the confines of this square table. We want it setup for Christmas morning and want to stick to Thomas and Brio. Any insight/help would be greatly appreciated! We have a small square train table, so I’ve actually been meaning to write a guide for how to build train layouts on it, because it definitely is more tricky. But it can be a kind of fun puzzle once you get the hang of the tricks. Mainly, it helps to have as many of the small curved tracks as possible, so the turns can be that much tighter. We have some small switch tracks, and that made it a lot easier to build more complex layouts in the confines of the square shape. I think at some point I actually purchased more small curves, straights, and switches just for the train table. I used to really enjoy building up with elevated tracks on the table, but that would usually take some trickery to curve the elevated stuff at the top with short curves so it could fit. I hope that helps! Thank you, can I ask do you have any favorite sets (Thomas or Brio) that you really like for square table or bridges that you have found that work well? Pretty much all the Thomas sets are going to be too wide, but most of the Brio ones will work, I think — hard to say without having used the table as a train table in a year or so! But Brio sets tend to be simple and more square in shape. 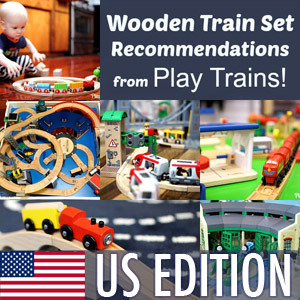 Out of the sets I have listed on our Best Wooden Train Sets guide (http://play-trains.com/best-wooden-train-sets/), I’m pretty sure all of them would fit on the table except for the Travel Switching set and the Deluxe set. If you want to get creative later, the two sets I always enjoyed building with on the table were the Thomas Gold Mine Mountain set (with short curves between the parts of the mountain to get it to curve) and the spiral set…the Thomas Wooden Railway spiral mountain is no longer available (sadly, because it’s a favorite), but we also used to use the Imaginarium Timber Log Spiral Set on the table a lot. While it’s not Thomas or Brio, it was great for that little table, and there’s actually a lot of things you can do with the supports for the spiral beyond making a spiral. You can see a pretty good shot of a layout I built with the spiral from the spiral set under the Imaginarium heading on that best wooden train sets post.